Contacts can be added to your myHEALTHware account by either inviting a patient to enroll in myHEALTHware from the patient chart or by manually adding a contact in myHEALTHware. 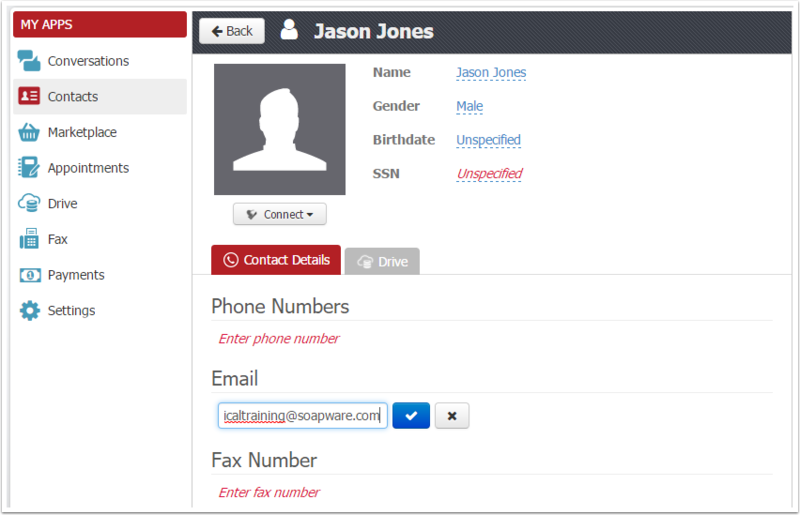 This lesson describes the steps that should be used to manually add a contact in myHEALTHware. The user may want to manually add contacts to myHEALTHware for referring or consulting providers, colleagues, pharmacies, patient family members/caregivers, other clinics, etc. This method should not be used to add a patient; the patient should be invited from their chart. Click on the Contacts tab on the left-hand side of the screen. 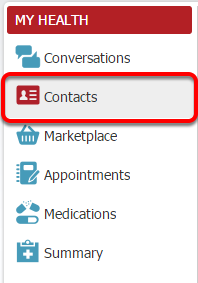 To add a contact to a non-patient myHEALTHware user, Direct Address user, or organization, click the New Contact button. Select the contact Type (person, organization, or group). For individuals (colleagues, other physicians, patients caregivers, etc.) you will want to select Person. *Note: If you wish to connect with an organization, the contact must be entered as a Person to invite them to connect on myHEALTHware. Enter the name/title of the contact. Enter an email address for the contact. Select the type of contact (patient or staff member). In most instances, you will want to select patient here. If the contact you are adding is not necessarily a patient, but a colleague, other physician, clinic, or a patients caregiver, you will still select patient from the drop down menu. The only instance in which you would select staff member is if you are adding an actual clinic employee to myHEALTHware (however, this should be done through the SOAPware wizard - not from this area). Edit the message that you wish to send to the contact in the invitation. Click Invite. This will send an email to the contact asking them to connect with you on myHEALTHware. For further instruction on connecting with contact in myHEALTHware, please see: Invite a Contact to Connect with you on myHEALTHware.